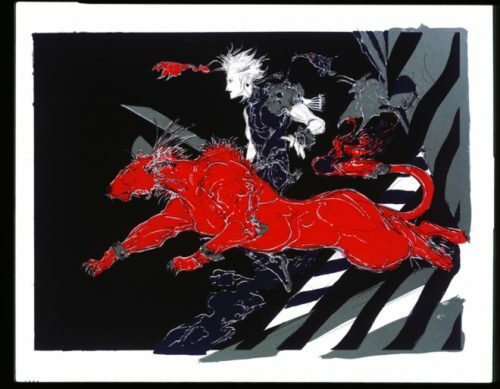 Japanese illustrator Yoshitaka Amano has had a subdued but constant presence on this site, but I don’t think I could ever downplay his importance on me. If his style hasn’t exactly been as influential on mine, his ethic and persona have been. In every interview I’ve read (albeit translated) from him, I have always been impressed by how grounded and practical Amano is in light of being a painter of fantasy with such an ethereal and imaginative style. I know him––and most nerds probably know him––from his work on the Final Fantasy franchise of video games. He is the only member of the production who has been involved in every single iteration since the beginning, though how integral he was to development has varied over the years. Needless to say, he has become the spine of the book that is everything Final Fantasy, and as we approach, surprisingly, the 20th anniversary of the release of Final Fantasy VII––arguably the first game where he moved from the artistic front seat to the back, ironically––he is being celebrated along with everybody else that worked on the game. The video game news website, Polygon, has put together a rather wonderful oral history of Final Fantasy VII, and included among the contributors is Amano himself, along with a video of him drawing as he talks about his input on the game. Its’ an amusing video for a few reasons. Again, it was the first game in the series that he wasn’t the primary character designer on (for a variety of reasons), so his involvement is a bit more understated than other members of the staff. Second, what really comes through is how much of a job this was. Final Fantasy VII was the launchpad that took the series from being the jewel in the crown of home video game console role-playing games (specifically, Japanese Role-Playing Games, or JRPGs) and made it into an industry-wide sensation. But even then, what’s clear is that for most of those who worked on this game, like most games, was more a work of pure effort and talent than the artistic expression that we tend to want to attach to nostalgia. They had no idea how important these cartoons would eventually be to the children who were watching and I’m sure, especially for the Japanese game development industry, many who worked on the games of our youths feel much the same way. I’m so pleased that most of those involved with things I loved as a kid are around to receive the adulations and praise they so very much deserve, because it’s safe to say that people like Yoshitaka Amano and his colleagues are responsible for those making great work today.